With its prominent position in the arms trade, and the impunity it grants countries like Saudi Arabia, Britain is playing with fire. September 5, 2017 - London, UK. 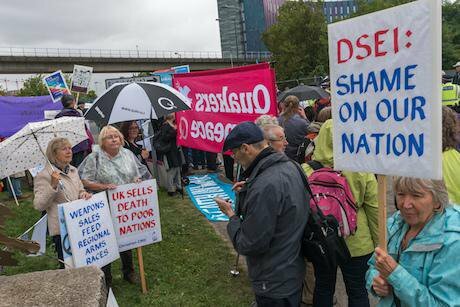 The second day of protests against the world's largest arms fair held in London's docklands. Peter Marshall/Zuma Press/Press Association Images. All rights reserved.“Blowback” - a term used to describe the costs and consequences of a government’s actions. A term that perfectly illustrates Britain’s harmful role on the world stage - particularly in the arms industry, and how this in turn endangers the nation. Many observers have depicted Britain’s foreign policy as promoting justice worldwide. Robin Cook, foreign secretary under Tony Blair, famously said in 1997 that Britain would pursue an “ethical foreign policy” that would “make Britain once again a force for good in the world”. Some today would still agree with Cook’s comment of Britain’s foreign policy in recent years. Yet in practice, Britain’s position on the global stage has hardly reflected such claims. Alongside the many destructive invasions, it is one of the world’s largest arms dealers; its arms sales have also increased in recent years. Not only are these weapons directly sold to human rights violators like Saudi Arabia and Israel, who commit atrocities on Yemen and Palestine respectively, they often end up in the hands of those who threaten British lives. Terrorists in other words. The latter is nothing new. Britain’s actions have aided groups that threaten its national security for a significant part of the twentieth century. Take Margaret Thatcher’s role in arming the Afghan Mujahideen against the Soviet Union – alongside the USA, Saudi Arabia and others. She can be seen telling the zealots who would go on to make up Al-Qaeda: “the hearts of the free world are with you”. Needless to say, this is the group that carried out the 7/7 bombings on British soil – which killed 56 and injured 784 British citizens, among other countless atrocities. Yet Britain’s stance has not changed. In the so-called ‘war on terror’, such policies linger. Britain has pledged to stand against Islamic State (IS) and other militant groups in the region. Yet an Amnesty International report reveals that IS has mostly gained its weapons from Britain and its allies flooding Iraq with weapons, which the extremist group have seized. Across the Middle East and Africa, Britain has continued this hazardous policy of arming volatile nations. It struck a number of huge arms deals worth millions of dollars with Libya after Colonel Gaddafi fell in 2011, and has done the same with Nigeria. Yet these war-torn nations are at risk of being overrun by IS in Libya, Boko Haram and potentially others, which raises concerns about British weapons falling into the hands of more extremists. Libya is a particular concern, as it borders the Mediterranean Sea, giving potential militants access to Europe. "The lifespan of a weapon is often longer than the political situation it is sold into. Weapons travel and we don't know where they might end up. Groups like ISIS have seized large quantities of western arms, including UK weapons,” Andrew Smith, spokesperson for Campaign Against Arms Trade (CAAT) said in an interview. Smith added, “Pouring weapons into war zones doesn't make any of us safer, and only makes it more likely these weapons will be used in atrocities for years to come." Even as IS rapidly loses territory, its weapons and disillusioned fighters could be transferred elsewhere, or end up in the hands of a new extremist faction. And also, if Britain fails to reforms this interventionist foreign policy it has pursued for decades, it could empower other deadly factions several years down the line. Not only that, Britain must also reassess another factor that will create more national security threats: its insidious relationship with Saudi Arabia. Many have accused Saudi Arabia of financing and aiding terror in the Middle East and further afield, including IS. Logic dictates that Saudi Arabia will continue to stoke tensions in the region, creating more conflict and enhancing the global terrorist threat. Yet the British government shows reluctance to address such actions from their unruly ally. After all, it has failed to confront the Kingdom over accusations of aiding radicalism within Britain itself. A report surfaced in July revealing Saudi Arabia’s role in financing and nurturing extremism within the UK. Yet the government has ignored it and concealed its contents. A group of survivors from the 9/11 attacks – which have been linked to Saudi Arabia, had also urged Theresa May to publish the report. As well as putting British lives at risk, the UK’s foreign policy contradicts the public's wishes. One poll shows that most British people oppose selling weapons to Saudi Arabia and other human rights abusers. This is unsurprising, as such policies make the world a more dangerous place. While the British government has pledged to end terrorism and protect its citizens, it has only increased the risk of them being harmed. It is vital that the British government rethinks its risky foreign policy. With its prominent position in the arms trade, and the impunity it grants countries like Saudi Arabia, Britain is playing with fire. Only by withdrawing its impunity towards certain nations and curtailing its arms policy can Britain take the necessary steps to genuinely tackle threats to its national security, and prevent future ones from emerging. It could also inspire others to pursue a more just foreign policy too.